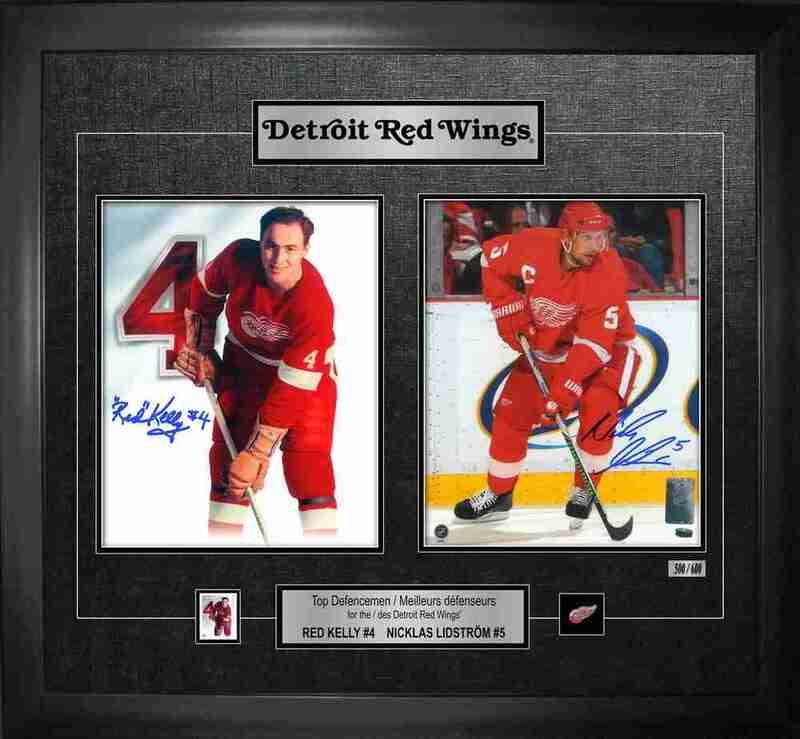 This Canada Post limited edition of 600 framed collage has been personally autographed by two of the top defensemen in Detroit Red Wings history, Red Kelly and Chris Nicklas Lidstrom. Below is a plaque with "Top Defensemen of the Detroit Red Wings" written in both French and English. Patrick Kelly, famously known as Red Kelly began his NHL career in Detroit during the 1947-1948 NHL season. He was given the name Red for his fiery hair similar to the logo on the front of his jersey. For a solid 13 seasons in a Red Wings uniform Kelly had an astonishing career. One year after stepping foot into the League Kelly was hoisting the Cup. He would hold the Cup high 3 more times with the Red Wings and 4 times with the Maple Leafs. The numbers do not lie when it shows that through 1,316 career NHL games he collected 281 goals and 542 assists for a total of 823. His offensive demeanor was incomparable at the time; he was the top defenseman in goals and points for five straight seasons and one of the top three in the next four seasons that followed, having James Norris Memorial Trophy to his name One thing that does not show on the score sheet is sportsmanship and gentlemanly conduct. Growing up Kelly was trained to control temper, stay out of the penalty box, that the most important part of the game was to help your team on the ice. Although Red played the game hard he definitely played it cleanly. With Detroit, he was awarded 3 Lady Byng Memorial Trophies for his sportsmanship and also one with Toronto. Kelly set the bar for future defenseman that came into the League. There is no one that could take his place, but Nicklas Lidstrom definitely reached the bar Kelly set. Drafted 53 overall in the third round of the 189 NHL Draft, Lidstrom began his NHL career during the 1991-1992 season. As a rookie Lidstrom had a breakout career scoring 11 goals and 49 assists for a total of 60 points. Lidstrom would spend the 20 seasons of his career with the Red Wings, totalling 50+ points for 15 of those 20 seasons. His production on the backend helped the Red Wings win the Cup in 1997, 1998, and 2002. When the Wings won the Cup 2002 Lidstrom was awarded the Conn Smythe trophy as he tallied 11 goals and 16 assists. Four years from when Lidstrom won his third Cup, he was honoured to where the C from 2006 until the end of his career. As captain he led the Wings to winning the Cup in 2007-2008, being Lidstrom's fourth and final Cup victory. The 7 time James Norris Trophy Winner retired during the 2011-2012 season. Upon the retirement of both Lidstrom and Kelly, their numbers hang on the rafters of Little Caesar's arena to honour these two defenseman and their amazing careers with the team. Kelly and Lidstrom were also named one of the "Top 100 Players of All Time" during the 2017 NHL Centennial Season and have their names in hockey's historic Hockey Hall of Fame. This limited edition piece is perfect for any Red Wings or hockey fan. It comes complete with a Frameworth hologram and COA to ensure the authenticity of the signatures. Finished size: 24.5x20.5"